Separation Of Church And Neighbor? My friend K lives in a small town not too far from Portland. She and her family live in a cute little house on a quiet street. Quiet, that is, until the church moved in across the street. I use “church” in a loose sense. The man who moved in “saw the light” after a life of sinning. He now fancies himself something of a preacher and is trying to form a new congregation. In his garage. Which no longer sports the typical garage door, but now has a regular door, and a sign declaring its status as a congregation meeting place. Nothing wrong with any of that, of course. But where does your right to form a church end and my right not to join it start? The members of this congregation are not afraid to cram their beliefs down the neighborhood’s collective throat share their beliefs with their neighbors. On Sundays and Wednesdays when the meeting is in session, the sermon carries throughout the neighborhood thanks to the magic of amplification. At 4:00 am each weekday morning, taped hymns drone through the air along with the rasp of a flaky car starter. Last summer, when K and her family tried to enjoy their yard, the congregation was always ready to stand across the street singing hymns as loudly as possible. The neighbors are beginning to feel a bit harrassed. There is speculation among the neighbors that the real “reason” for forming a congregation has less to do with suddenly finding Jesus and more to do with suddenly discovering the tax-exempt status of religious bodies. An elderly neighbor who had lost her husband of 50 years only two weeks before, lost control of her car and damaged some of the “church’s” property. Being an honest citizen, she confessed to the “reverend” what had happened. Under the circumstances, one might expect a certain amount of understanding and compassion from a minister. After all the damage was relatively minor. The driver was insured and the church, one would expect, is also insured. Instead, the confession was answered with a threat to sue the driver for malicious damage. Not the most “Christian” of reactions. But how do you get a church moved out once it’s moved in? It’s not a business, per se, so zoning laws may not apply. For now, K is sleeping with earplugs to avoid the 4:00 am choir and considering an outdoor stereo system for use during the summer. Hazel Patricia and Phinnaeus Walter. Those poor kids. I hope they come up with some fairly mundane nick-names — Pat and Wally, maybe — before they go to school and get creamed on the playground. I wonder if either of the parents bothered to talk to people with unusual names — the Zappa kids, maybe — before deciding to saddle their kids with one. The ex and I actually considered naming #1 Son “Simon Oliver” — until we realized that his initials would be “SOB.” How would that look monogrammed on his shirt pocket? Ya gotta consider these things. So, if you work with me, STOP LOOKING! I used Lion Homespun in Country for the wreaths. The candy canes are made from some generic 4-ply worsted weight that has been in my yarn basket for years and long ago lost its label. The pattern is mine, and I don’t mind sharing. Click on the link below if you are interested. Ch 52. In second ch from hook, sc 3. *sc 3 in next ch. Repeat from * to end of chain, allowing the work to twist as you go. Candy Cane: Make one red twist and one white twist. Then twist them together to make the “stripe.” Insert a pipe cleaner along the chain in the center of the twist and bend to make candy cane shape. Wreath: Make one green twist. 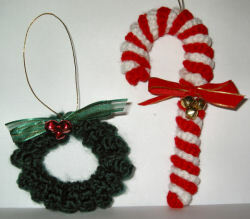 Insert a pipe cleaner along the chain in the center of the twist and bend to make wreath shape. Fasten ends of twist together at the “top” of the wreath. Both: Decorate as desired with ribbons, bells, etc. It’s not hard for me to stay away from the malls between Thanksgiving and New Years. I like leisurely shopping trips. Full-body-slamming crowds give me claustrophobia. So “buy nothing day” isn’t really that much of a statement for me, all things considered. #1 Son was bound and determined not to buy anything today. But, it’s Friday, and Friday is allowance day. I told him I’d keep giving him allowance until he gets paid at his new “real” job. But I didn’t have enough cash today for his allowance. I could see his desire to make a non-consumerism statement warring with his desire for filthy lucre. Finally, though clenched teeth, he admitted that he really wanted it today. So I bought some cheese at the store. I was out, and I needed it for my turkey shepherd’s pie (which was yummy). I don’t know whether #1 Son spent any of his allowance or not. I don’t think I’ll ask. I refuse to start Christmas until the day after Thanksgiving, regardless of how many decorations merchants put up or how early they start piping in Christmas music. But now it’s time. So below is my eggnog recipe, plus my recipe for post-Thanksgiving leftovers shepherd’s pie, a tradition at my house. And, why not, I’ll throw in my family’s traditional recipe for Tom & Jerry batter. Over the river and up the freeway, #1 Son and I traveled to B’s & K’s house. Thanksgiving was great fun. B & K put together an awesome evening. It was a smallish, rather quiet group this year. But the company was pleasant, as always, and the food was yummy, as always. K was very brave this year and used paper plates and plastic ware. You GO K! I think that was one of the best ideas I’ve seen for a long time. Who wants to hand-wash all that china and stuff, not to mention ironing all the linen? #1 Son always feels as though it’s not a successful large gathering unless there is at least one crisis. Last year the boyfriend of the younger B & K daughter was supposed to bring the rolls. He found them in the trunk of his car after the meal was over. But we all gave him credit for trying. This year the rolls were in attendence, but needed warming. So B placed them in a paper bag and popped them in the oven — the time-tested, traditional method of warming rolls. But the bag accidentally touched the burner and caught fire. So there was a bit of excitement for a few minutes while B threw the bags in the sink and eldest B & K daughter attempted to douse the still-burning bag, part of it in the sink and part fallen to the floor. For some reason she grabbed salt instead of soda to smother the fire. Salt doesn’t really work the same way… But eventually the fire was extinguised. Most of the rolls made it through the ordeal unscathed (and unheated). #1 Son missed the whole thing. “There hasn’t been a crisis,” he said, disappointed, during dinner. He was even more disappointed when we told him about The Incident Of The Burning Bag. But he agreed that the evening was, therefore, a rousing success. Oh. Oops! But another bag was found, and, loot in hand, #1 Son and I traveled back down the freeway and across the river and home. This year I will be the only one indulging in post-Thanksgiving shepherd’s pie, being the only two-legged household carnivore (the cats do not get my turkey!). So it will be a small batch, but one greatly enjoyed! Click the link below for the recipes. Combine all ingredients and stir until blended. Enjoy! This recipe comes down to me from my great grandmother. It’s been updated through the years (I don’t think she had an electric mixer, but my grandmother did). Traditionally the batter was started early on Christmas morning and left to beat in the mixer all day to be served right before dinner. The theory was, the longer the batter is beaten the less chance that the eggs will separate later. If you aren’t comfortable doing that (and these days we know better than to leave eggs at room temperature for 6 or 8 hours — it’s a wonder none of us got sick), the batter can be rebeaten if it separates in the fridge and it will taste fine. Divide eggs. Whip egg whites until stiff peaks form. Set aside. Beat egg yolks until golden yellow. Fold in egg whites. Slowly add in confectioners sugar until well mixed. Beat in electric mixer on low speed for a long, long, time (see note above — probably a minimum of 15 minutes or so). To server, pour one or two tablespoons of batter into a cup. Add a jigger of favorite flavoring (rum, whiskey, scotch, can be omitted for a “Tom” without the “Jerry”). While stirring rapidly, fill cup with hot water. Sprinkle top with nutmeg. Combine first four ingredients in a casserole dish. Add a enough water to the gravy to make a nice sauce for the pie and pour over other ingredients in the dish. Top with leftover mashed potatoes. Sprinkle potatoes with shredded cheddar cheese. Bake at 375 – 400 until pie is hot and bubbly and cheese is melted. The Persistent Illusion household heads north for turkey day. The last several year’s we’ve gone to B’s house. B is an old friend of mine who I’ve known for many years and worked with a couple of times at different employers. We’ve been invited to their house for Thanksgiving for the last several years. Now, I wasn’t really sure when reading this sentence if I was really invited, or if he just wanted the sweet potatoes shipped up to Vancouver via FedEx. But I assumed the former and replied that, yes, #1 Son and I would be coming along with the potatoes. My recipe for candied sweet potatoes (that should probably really be called “carmelled sweet potatoes”) has been passed down through the women of my family for generations. I know it goes back over 100 years — back to the days when nothing was canned (unless you preserved it yourself) and all fresh ingredients were used. It’s very specific about its ingredients, and does not include marshmallows, nuts, or other icky things. It’s a very plain, unassuming recipe. People that claim to hate sweet potatoes love these. I only make them a couple of times a year, but I really like them. So if we are invited someplace during the holidays, I always offer to bring sweet potatoes. That way I know I’ll get to eat them. I’ll put the recipe below. B and his wife K take in strays during the holidays, so there’s always an interesting and eclectic group there for dinner. It’s a lot of fun because I never know who I’m going to meet. One year there was a woman who was a proponent of medical marijuana, apparently on a frequent basis. She kept something like 50 or 60 cats and didn’t understand why her neighbors complained. She spent a lot of the visit talking about how wonderful pot was, which pissed me off a little since #1 Son was younger then. But she also complained about having no short term memory. Go figure. She actually turned out to be a walking anti-drug-abuse poster, so I forgave her excentricities. For several years a couple who made the most wonderful wine came. But I don’t believe they will be there this year since they have moved out of state. It’s a pity, because this year I’m actually not taking any medication that would preclude imbibing. Last year I only got sips. Whoever is there, it’s bound to be fun and interesting. #1 Son, of course, is now vegetarian. So that means I get to eat his turkey and stuffing! And I wish everyone a safe and happy Thanksgiving. Click the link below for the “Candied Sweet Potatoes” recipe. Make a syrup with the brown sugar, butter and hot water. Boil the sweet potatoes until tender but still firm. Peel and slice lengthwise in 1/2″ slices. Place in buttered oblong baking dish. Pour the brown-sugar syrup over the top. Bake in a medium oven for 1 hour. — Medium oven: Bake at 375 for 1 hour or 350 for 1-1/2 hours. Whatever temp you are baking your turkey at is probably sufficient. Just adjust the time accordingly. The recipe isn’t picky about time — longer is usually better than too short. Cover with foil if the sweet potatoes start to look dry. — How to make the syrup: In a large sauce pan, melt the butter. Add the brown sugar and the hot water. Bring to a boil. Boil briskly, stirring occasionally, until syrup is thick enough to coat the back of a spoon. — After boiling the sweet potatoes, drain them and let them cool until they can be handled without burning your fingers off. Steaming works as well as boiling. — When taking these to someone’s house for a dinner (say, up to 15 guests or so) I usually use 6 sweet potatoes and double the syrup. They’re good as left-overs so bringing too many isn’t a problem. — Grandma said that you should bake the slices in a single layer, but she must have had a bigger baking dish (and oven) than I do. I put multiple layers of slices in my dish and pour some of the syrup between the layers. It’s also helpful to baste the top layer occasionally during baking. — These can be made and held for a long time in a warm oven, and they re-heat via microwave great.